This is Beachy Head Lighthouse, East Sussex. I took this shot on a blustery day in May 2010, as scudding clouds created shadow patterns over the shallow water at the base of the chalk cliffs the lighthouse guards. 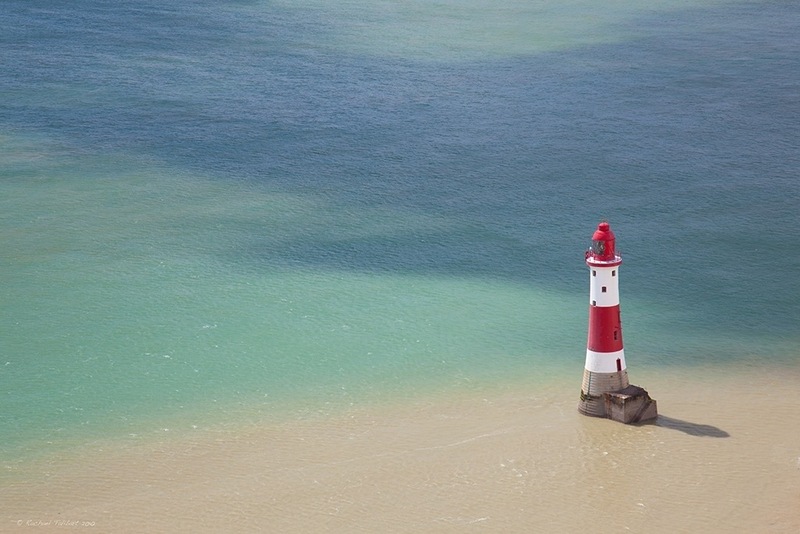 The lighthouse was built in 1902, warning ships of the cliffs with a light at night and its bright stripes by day. In September, Trinity House announced that it could no longer justify the cost of painting the lighthouse, modern navigational aids making this precaution redundant. Needless to say, many people are reluctant to see the lighthouse fade to grey and a campaign has been running ever since to raise the funds to keep this iconic lighthouse beautiful. This entry was posted in photography, travel and tagged Beachy Head lighthouse, East Sussex, England, history, lighthouse, photograph, photography, Trinity House by Rachael. Bookmark the permalink. Not sure you could have got a better patterning in the sea! Makes a great backdrop to the lighthouse. Thank you, Stephen. It is a great location. Good heavens, Rachael — to quite Liz Lemon, I want to go to there! Heh. Glad folks are working to preserve it. It’s gorgeous! It is such an icon, especially for someone who grew up in a South Coast yachting family. Yes, nothing beats a good lighthouse. One would think some kind of project to help the long-term unemployed, or “green grants” or whatever, would serve multiple purposes here. You would think so, wouldn’t you? But there is quite a lot of resistance to FDR type programmes here. People think it’s tantamount to slave labour. I tend to think it’s better than having people idle, but I am a simpleton when it comes to things political. I’m with you on this one Rachael… ( not that you’re a simpleton !! ) Great shot of this iconic image.. So beautiful. Great framing in this shot. Kind of reminds me of a painting. Thank you! It pleases my tendency towards the minimal. How gorgeous – love those colours in the sea contrasting with the red. I do hope they manage to preserve it. Thanks, Tricia. But it wouldn’t look like this if you did – it is raining, again. Beautiful. Love the colours and composition of this shot. You’ve really made the most of your vantage point. Beautiful shot Rachael, lovely composition and colours. What a beautiful shot of this lighthouse. I like it very much.